The rules and regulations for cycling in each Australian state can be confusing. A lot has changed over recent years, with the states and territories trying to reduce confusion by introducing similar laws to one another. Down below we’ve broken down each state’s laws on whether or not cyclists can ride on footpaths with their children, and on what conditions. The New South Wales and Victorian governments both allow children under 12 years of age (and their adult supervisors) to ride on the footpath  . Cyclists (without children) are also permitted to ride on footpaths where signs indicate or when certified to do so by a doctor. Western Australia, South Australia, Queensland, Tasmania, A.C.T & N.T. Legislation in the remaining 4 states allows cyclists of all ages to use the footpath for cycling, particularly encouraging those who are leisure riders and those with children  . Please note that certain footpaths in these states can be classified as cycle-free areas (or ‘No Go Zones’) and signage will be present indicating this  . In these instances, it is legally required for the cyclist to ride on either the road or the shared-path provided  . 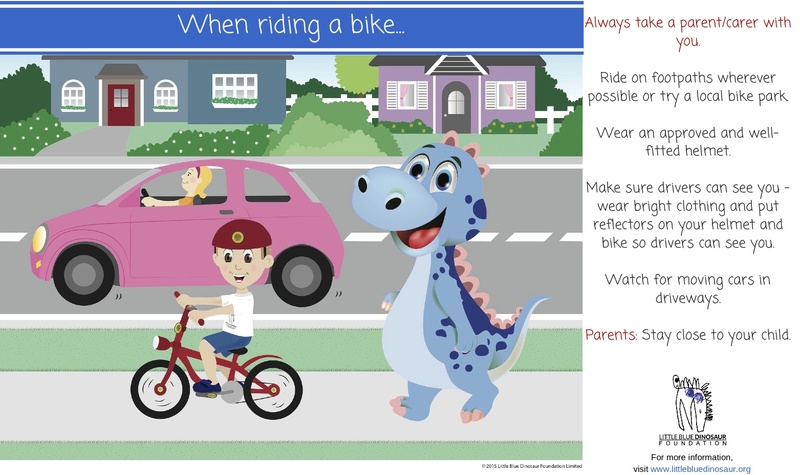 The Little Blue Dinosaur Foundation would like to remind everyone that cyclists of all ages must be wearing a well-fitted, certified helmet at all times. If you are cycling in one of the states that allow you to ride on the footpath, please be conscious of your surrounding environment and always give way to pedestrians. Keep to the left of the footpath and if riding with multiple children, ensure you have a road safety discussion before you start cycling. Please be aware that penalties apply for not obeying State cycling laws. If you would like more road safety information for your children, please visit our education page.